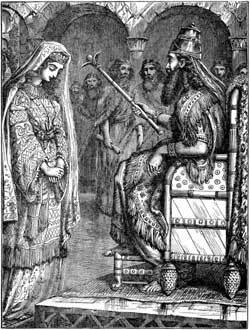 HASUERUS REIGNED OVER the vast empire of Persia, and Esther, the adopted daughter of a Jew named Mordecai, was Queen. None in the palace knew she was a Jewess, for Mordecai had charged her not to make it known. He abode in the king's palace, and was one of the king's servants. Ahasuerus promoted Haman, one of his courtiers, a cruel and wicked man, to be over all his princes and officers; and all bowed down to Haman and did him reverence except Mordecai, the Jew. Then was Haman filled with wrath against Mordecai and his people, and obtained from the king a decree ordering that all the Jews throughout his dominions should be slain. Mordecai informed Queen Esther of this decree, and bade her go to the king and plead for her people. Now it was one of the laws of the palace that no one should approach the king in the inner court unless he had been previously called; the penalty for not obeying this law being death, unless the king should hold out the golden sceptre to the offender so that he might live. Esther knew the danger of approaching the king uncalled for, but she bade Mordecai to gather the Jews so that they might spend three days in fasting and prayer, while she and her maidens did the same, and, said she, "So will I go in unto the king, which is not according to the law, and if I perish, I perish." Esther went in. The king graciously held out the golden sceptre to her, accepted her invitation to a banquet, and finally ordered the wicked Haman to be hanged, and measures to be taken to preserve the lives of the Jews.